In my recent blog post, I explained that the Modified Dietz rate of return gives a decent estimate of the money-weighted rate of return (MWRR). However, both types of returns are not ideal choices for investors who are interested in benchmarking their performance against appropriate indices. Some investment firms mitigate this issue by approximating a time-weighted rate of return for their clients. This can be accomplished by calculating the Modified Dietz rate of return over monthly time periods, and then geometrically linking the results (going forward, I will refer to this methodology as the “approximate time-weighted rate of return”). This requires month-end portfolio values, but avoids having to value the portfolio whenever an external cash flow occurs (which is required when calculating the time-weighted rate of return). When a large contribution is made prior to a sub-period month of relatively good (bad) performance, the ATWRR will overstate (understate) a portfolio’s performance, relative to the TWRR. When a large withdrawal is made prior to a sub-period month of relatively good (bad) performance, the ATWRR will understate (overstate) a portfolio’s performance, relative to the TWRR. 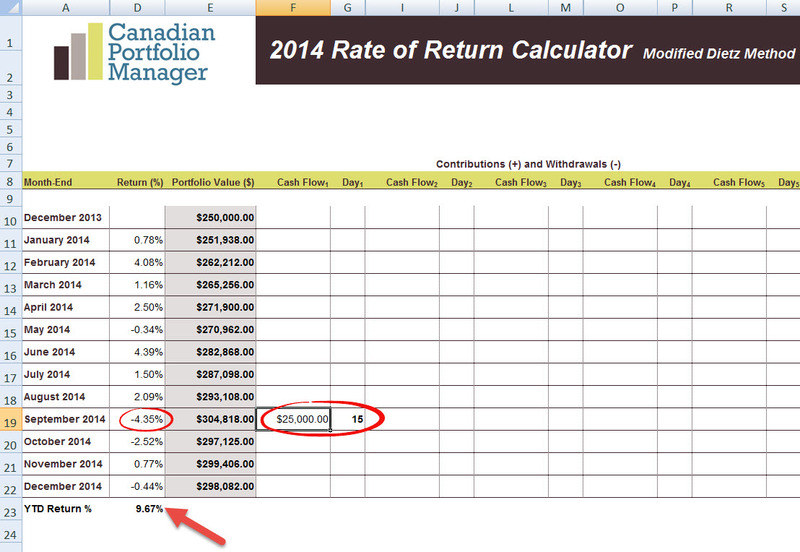 To make the ATWRR calculation easier for investors, I’ve created a user-friendly Modified Dietz annual rate of return calculator (with geometric linking of the monthly returns), available for free download on the Canadian Portfolio Manager Blog. Simply input the month-end portfolio values for the year in column E, and any contributions (+), withdrawals (-), and the day of the month that each cash flow took place in the columns to the right of column E (the calculator allows for up to five cash flows per month). I’ve included the calculator screen snapshots below for both investors, based on values from our original example. In order to help us better understand the differences between the ATWRR and the TWRR, we must first calculate the sub-period returns during the months when any external cash flows occurred (using the TWRR methodology). In our example, the only cash flows that occurred were during the month of September. For both investors, their sub-period rate of return before the cash flow occurred was -0.85%. After the cash flow occurred, the portfolio returned -3.42% for the remainder of the month (a relatively worse return than the first half of September). Over the entire month of September, the portfolio returned -4.24%. Investor 1 had a relatively worse ATWRR in September of -4.35% (when compared to the TWRR of -4.24%). This was because Investor 1 contributed $25,000 before a monthly sub-period of relatively bad performance (-3.42% versus -0.85%). They also had a lower ATWRR of 9.67% during the 2014 calendar year, when compared to the TWRR of 9.79%. Investor 2 had a relatively better ATWRR in September of -4.13% (when compared to the TWRR of -4.24%). This was because Investor 2 withdrew $25,000 before a monthly sub-period of relatively bad performance (-3.42% versus -0.85%). They also had a higher ATWRR of 9.92% during the 2014 calendar year, when compared to the TWRR of 9.79%. Although the ATWRR can differ from the TWRR when large external cash flows are made during a volatile month, it is still a decent choice for investors who are looking for an approximate method of calculating a rate of return that can arguably be benchmarked against index returns. As most investors will not be provided with a TWRR on their account statements going forward (and collecting daily portfolio valuations when external cash flows occur is not realistic), the approximate time-weighted rate of return would be my recommended choice for investors who are interested in benchmarking their portfolio returns. Hi Justin ! Will you share a new Time-Weighted Rate of Return calculator ? The one you share actually goes until 2020. It would be nice if the next one would go until 2100. I ran through the explanations concerning the use of the ROR calculators and did the examples, but I’m stumbling on the ATWRR calculation where you state Investor 1 had a relatively worse ATWRR in September of -4.35%, and Investor 2 had a relatively better ATWRR in September of -4.13%. Could you please explain the mathematical relation involved here to get to these results. Thank you and keep up your excellent work. @RICHARD SANSCHAGRIN: My example starts by calculating the true time-weighted rate of return (TWRR) for both investors for the month of September (which is an identical – 4.24%). You can see that in the first half of the month, the TWRR is -0.85% and the second half is -3.42%. So knowing this information in advance, if you had a choice on whether to contribute $25,000 mid-month or withdraw $25,000 mid-month, which would you choose? Of course you would choose to withdraw $25,000 mid-month. The investor who choses this option only loses 4.13% in the month of September, based on the “approximate” time-weighted rate of return methodology. The investor who adds $25,000 mid-month has a loss of 4.35%, based on the “approximate” time-weighted rate of return. So the approximate time-weighted rate of return method still has some of the characteristics of the MWRR or the Modified Dietz rate of return (i.e. it penalizes investors for bad market-timing, and rewards them for good market-timing). How do I calculate the monthly portfolio value in column E in the spreadsheet calculator, if my bank issues statements every 3 months? It shows the dates of my contributions, however it only shows the beginning balance and ending balance for the 3 month?